For the second day of touring Angkor, I would be on my own with James staying back at the hotel to work on videos. 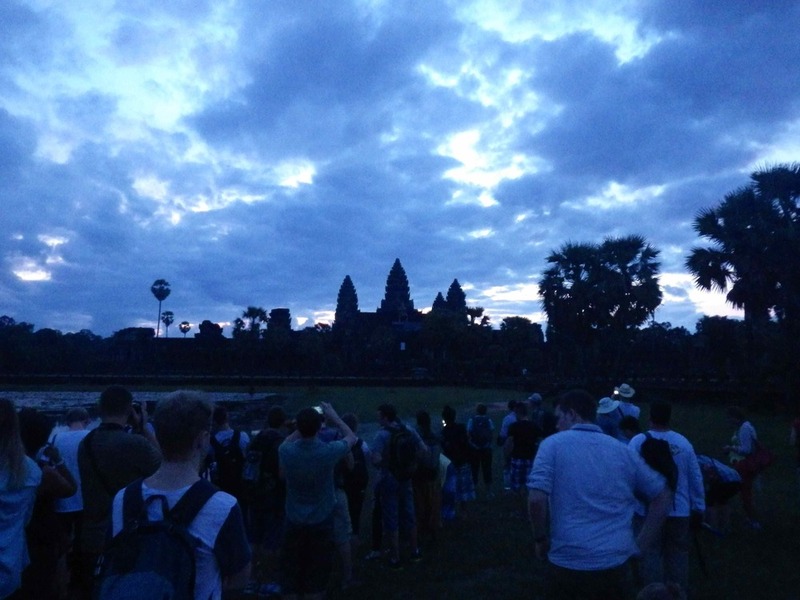 I started the day watching the sunrise at Angkor Wat. Funny enough James wound up going to see the sunrise later in month on his own – guess we like sunrises on our own. 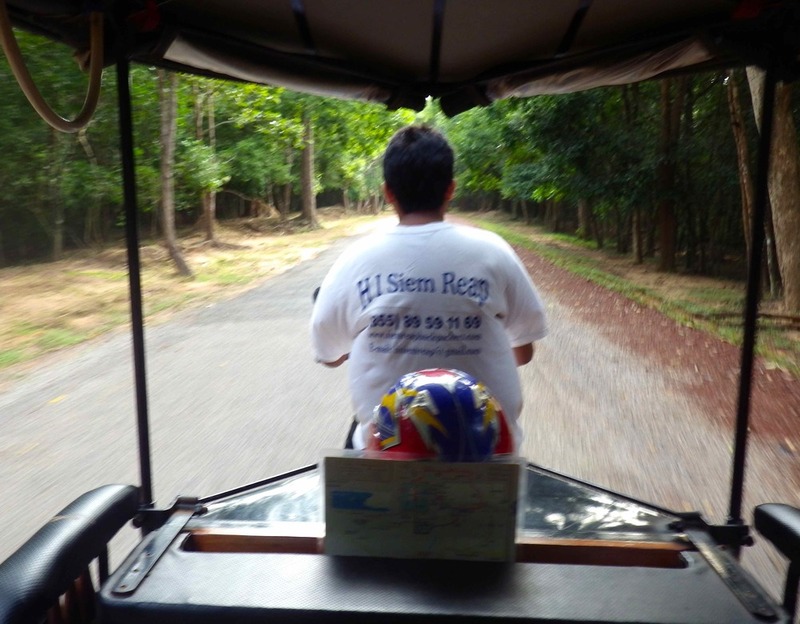 After a miscommunication with Davy regarding James (he thought we were waiting for him) we were running late for the sunrise but Davy kicked the tuk into high gear and raced me through Angkor check-in. 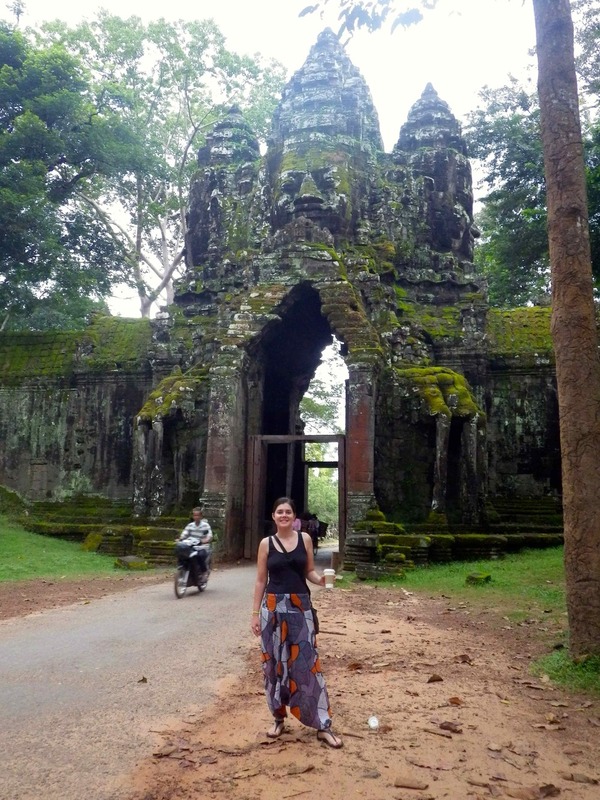 When I finally walked up the main road to the temple it was still dark and I had failed to bring a flashlight (guess studying the Lonely Planet Angkor guide really helped!) so I had to walk in the footsteps of someone else that HAD brought one. There are really big holes in the road (in random places) so it’s pretty dangerous to walk it in the dark. 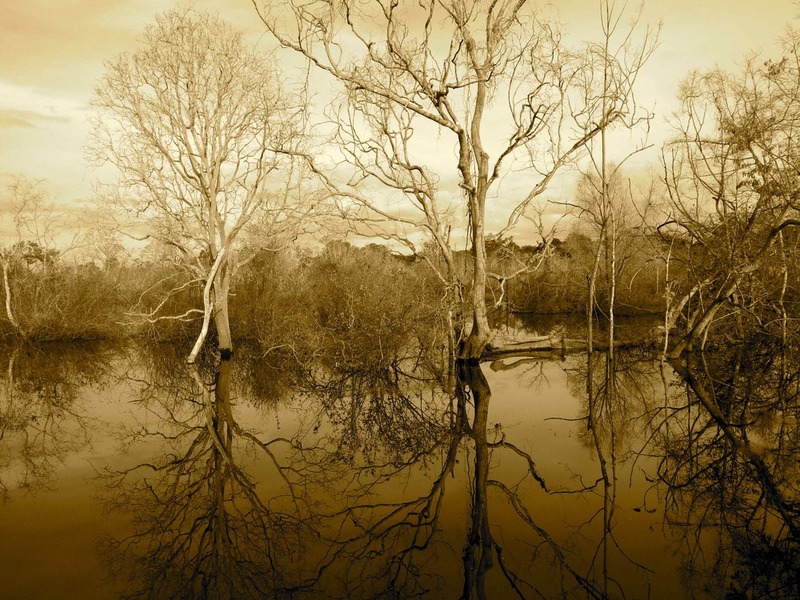 I went to the popular photo op area, where probably 1000 other people had gathered; this is at the foot of the lake in front of the interior Angkor Wat temple. Some people arrived VERY early to stake out the best spots and I hope their families back home will appreciate the photos for which they were relentlessly bitten by the lake mosquitoes for a long time in the dark. 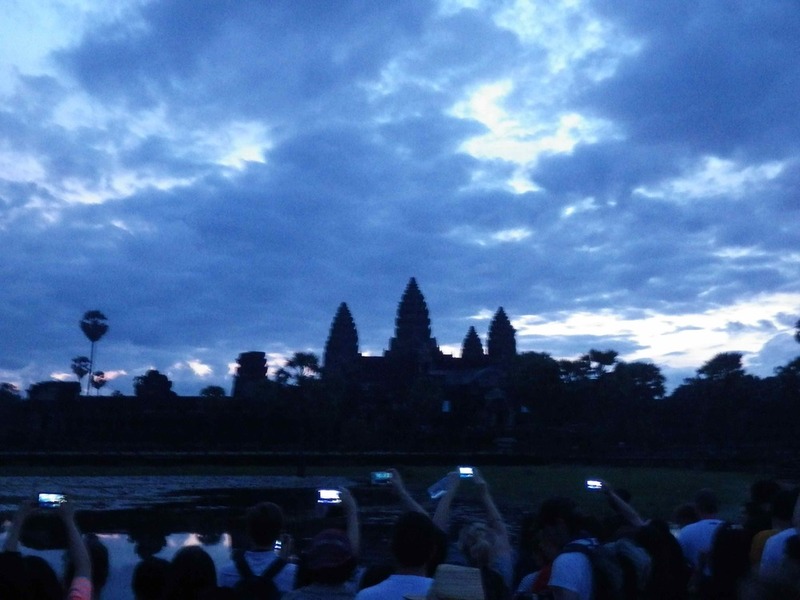 The sunrise was not spectacular, though Angkor Wat was. It was cloudy and there was not a particularly grand moment when the sun peaked out. So after fighting to get a few shots, I just enjoyed the scenery and when it was bright enough I wandered back to the main road for coffee. I took a few minutes to sip my coffee on the wall of the moat looking at Angkor all by myself and this moment was the real highlight of sunrise. 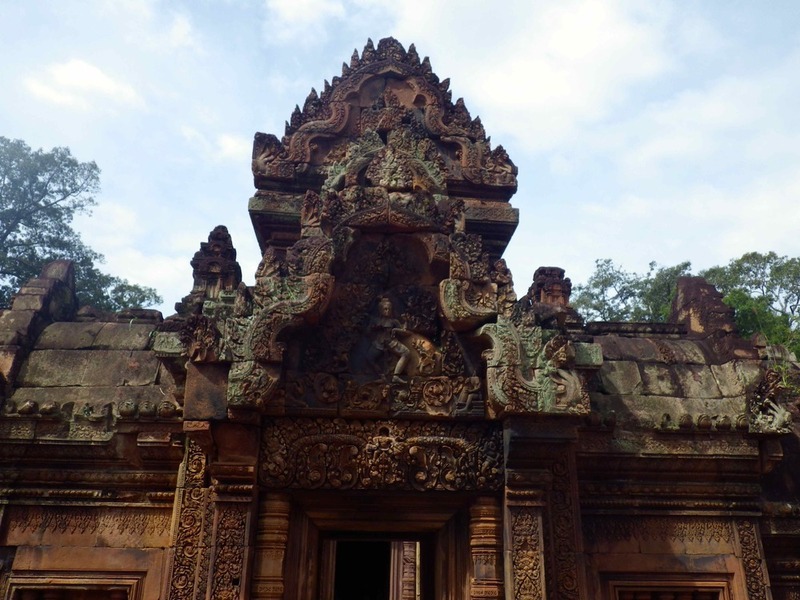 Davy suggested we head to Preah Kahn next, a sprawling temple site. The temple must have been enormous, with many corridors and courtyards. Restoration appears minimal and there are piles of stones from the floor and walls, in huge (sometimes impassable) piles throughout. We were the only people there and we tip toed through the temple with the only sounds from the jungle. It was an electrifying feeling…. Like we really were the first people to re-discover the ruins. 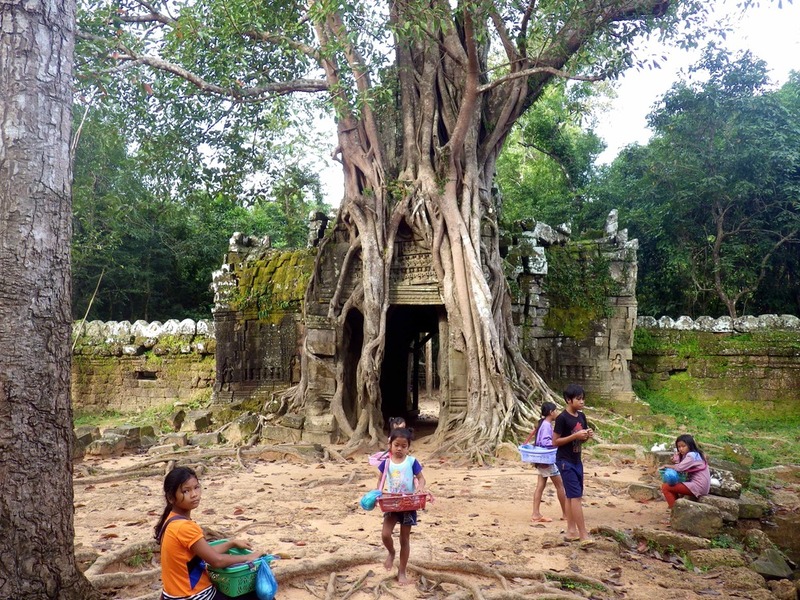 The Preah Kahn also has some major tree roots that have grown through parts of the temple. 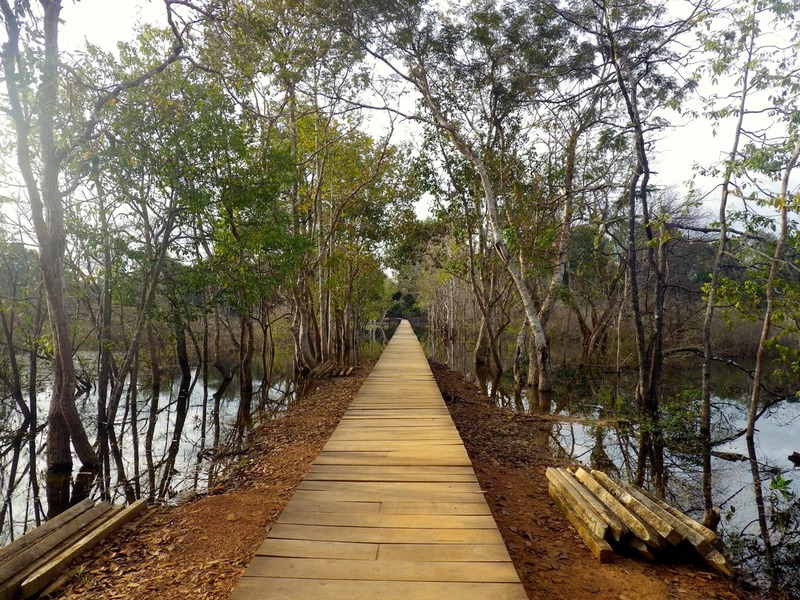 Next Davy dropped me off at Neak Pean were I walked alone on a long rickety wooden bridge (with no rails) over a large pond with eerie looking trees growing out from the water. At the end was a large fountain, consisting of 4 pools (representing water, earth, wind and fire) with a tower in the middle. 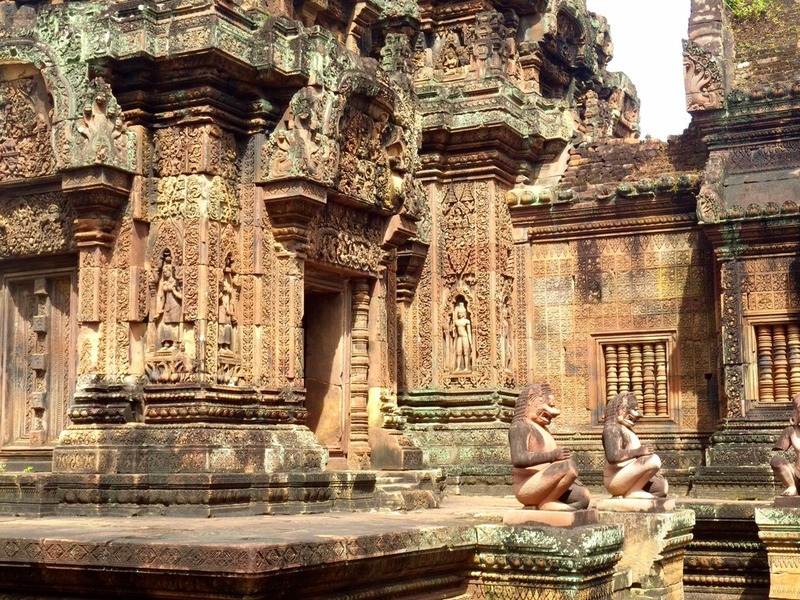 Built by king Jayavarman, it was intended to be a healing temple. Once again the entire visit to this site, alone, was magical! By my next stop at Ta Som few other tourists had joined our route and to completely break the spell a large group of the Cambodian children who sell trinkets at the temples pounced on me. Buying one bracelet was a mistake for now the other children took the very effective “but you bought from her” routine. I reluctantly bought another bracelet and ran away from them. From what I understood from the NGO I later worked with, these are not orphaned children. Permits are required for every booth and stand selling at Angkor Wat, which are NOT easily acquired. The booths and stands are family owned and operated, and the children selling at the temples are apart of those families. In general the whole practice is awful… the kids should be in school but instead are selling crap made in China to tourists and it breeds a system of the cutest/smallest children making the highest profits – I can’t imagine what effect that has on the children. 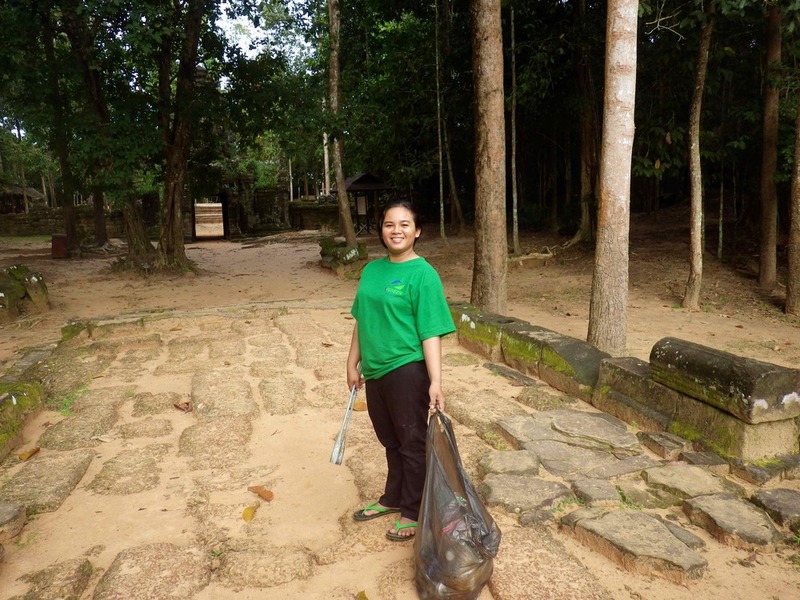 Though I tried to avoid the kids and supporting this practice, when I was visiting the temples alone it was SO HARD. The kids know you are weak prey and they went after me relentlessly! I wound up with 2 bracelets and a packet of postcards… I guess that’s not so bad. his site is a record of our round the world trip from 2013 - 2014.